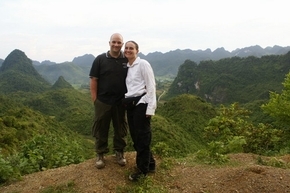 It's now a bit over a month since we got back from our vacation inVietnam and we're still not used to being back here. We've been planning to write you and tell you what we liked best about our ride with you - the scenery, the great guides, the superb food, the smiles, the belorussian beasts or the great guys who joined us. We couldn't come up with an adequate description, so we'd just like to thank you for the time of our lives! This trip has been life changing. We'll be back for another ride, but I guess you knew that anyway.